The HPC40 Series handheld pressure calibrator is the world's first combined pressure and mA loop calibrator to be fully temperature compensated from -20 to 50°C. You can count on the same accuracy whether measuring pressure, current, voltage, or temperature. Combine the HPC40 Series with any of our ready to use pump systems, to provide a complete calibration kit. 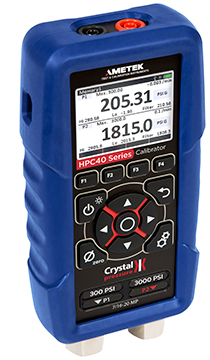 The HPC40 Series Pressure Calibrator combines high accuracy pressure readings with an intuitive user interface and bright color display. BARO BARO Module – Converts gauge pressure measurement to the absolute scale.